Three Celtic Songs: A Cradle Song [2:18]; A Boy’s Song [1:49]; The Fiddler of Dooney [2:59]. 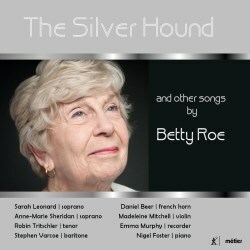 This is the first CD of music by Betty Roe that I have heard. In fact, I think that it might be the first retrospective of her music to be released. Betty Roe was born in North Kensington, London in 1930. From her early years, she has been involved with music. Her musical teachers included York Bowen and Lennox Berkeley. In 1970 Betty Roe and her husband, the late John Bishop, founded Thames Publishing which subsequently produced many important books and scores specialising in British Music. Roe is typically most regarded for her vocal music and songs: there are more than 300 of them, covering a variety of genres. There are also several operas, musicals, choral works and a fair selection of instrumental pieces. She has written that she doesn’t “enjoy big music” continuing “I find large scale orchestral works overwhelming and frightening to my ears, so it is unlikely that I will ever compose a symphony”. This seems a little bit of an exaggeration: an opera is hardly a miniature, and there is a Trumpet Concerto in her catalogue. But I take her point. She is clearly most comfortable writing songs. The present CD includes works written during the past 30 years. One issue I have with this CD is that no dates are given for each work. I am not sure how Roe’s musical style has developed over the years: my guess is that the combination of mid-20th century English song, light music and Flanders and Swann have served her well throughout her career. The songs on this CD are wide-ranging and often involve various combinations of voices and instrumentalists. They include parts for recorder (Celtic Songs), French horn (Silver Hound) and violin (Garden Songs). This usually reflects the organisations or individuals who have commissioned the work. I will comment on several (for me) highlights. A good place to start is provided by the delightfully humorous ‘Three Songs for Graham’. They were composed specifically for baritone Graham Trew and set some poems by Marian Lines, a long-time literary collaborator with Betty Roe. There is much wistful humour in these charming songs. It includes the only known setting of the word ‘Ceefax’ in the corpus of ‘English Lieder!’ As suggested above, these songs nod to Flanders and Swann. The liner notes state that Malcolm Arnold wrote ‘Lines Written in Kensington Gardens.’ I think it was probably the poet Matthew Arnold... This is the first of the pastoral ‘Two Garden Poems.’ The second song, which is anonymous, majors on a tiny seed that grows to maturity. It criticises all the other flowers in the garden, only to discover that it itself is a weed! The major event on this CD is the setting of Ursula Vaughan Williams’ poem based on the ‘Seven Ages of Man’ speech spoken by Jaques in As You Like it (Act II, Scene VII). The concept is that the singer sends his “hound back in time to fetch events from his life”. A Prologue is followed by a ‘Lullaby’, ‘The Schoolboy’, ‘The Soldier’, ‘The Lover’, ‘The Statesman’, ‘The Old Man’ and a final ‘Epitaph’. It is a complex, deeply thought out piece that deserves to be as popular as Benjamin Britten’s extended song cycles. The interaction of the horn, piano and the tenor soloist is exemplary. This is the most challenging and satisfying work presented on this disc. The ‘show-time’ ‘Diva’s Lament’ with nods to Cabaret, explores the ‘lack of age-appropriate roles for mature soprano’s. It is an ironic number, that may be a shade politically incorrect these days, although I get the drift! I enjoyed the Thomas Hardy ‘Conversations’. These songs, which are written for soprano and baritone duet, explore typically Hardy-esque themes. The first considers a wife who hoped she could reform her husband, the second is a ‘folky’ tune where a jolly farmer contemplates his funeral arrangements, and the final song reflects an ‘old maid’ who has given up her prospects to stay at home to look after her domineering father. All the songs are well-contrived and display a characteristically bitter-sweet mood. An interesting song is ‘Autumn’s Legacy’ which is a setting of a poem by the great musicologist and enthusiastic promulgator of British music, Lewis Foreman. At least I assume that to be the ‘Foreman’ who wrote the text! The song was written to celebrate Foreman’s 70th birthday and considers “the cycle of the seasons and wonders how many more he will see”. Plenty, I hope! Finally, the ‘Three Celtic Songs’ with texts by Padraic Colum, James Hogg and W.B. Yeats feature a recorder and piano accompaniment. The first song, ‘Lullaby’ is a croon reflecting the visit of the shepherd to the baby Jesus, the second, ‘A Boy’s Song’ reminds the listener of the once ubiquitous “cheery whistle” of the message boy and the final jig in ‘The Fiddler of Dooney’. Roe has caught the ‘Celtic’ mood of these poems without falling into the trap of writing pastiche. The CD is well-produced with splendid sound quality and convincing performances from all the artists. The liner notes give a brief overview of Betty Roe’s songs with additional comments about each work. As noted above, no dates are given. There are detailed biographies of the performers. The texts of all the songs are included.